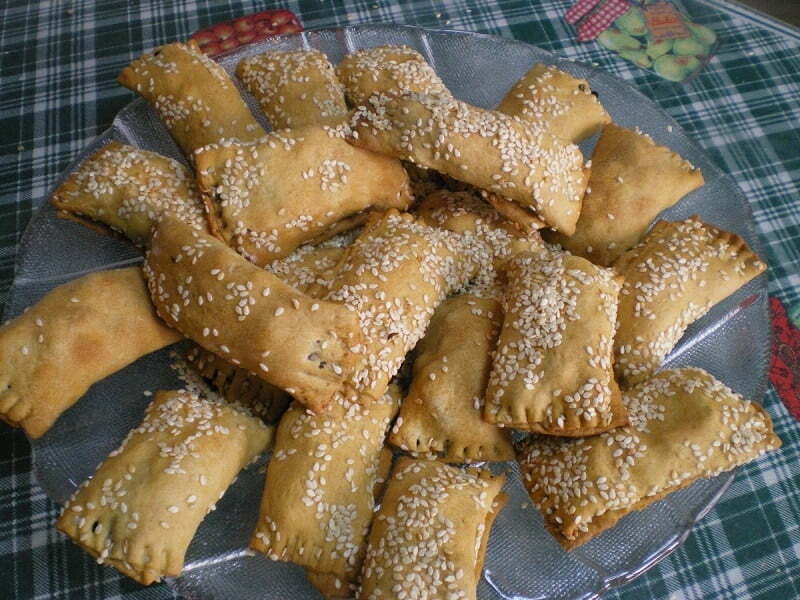 Eliopita, Eliotes or Eliopitakia are Cypriot olive pastries made either as a bread, as a roulade, as turnovers or a pie, to accompany a cup of coffee or tea. The dough is similar to the basic dough but instead of using water, the dough is made with fresh orange juice. For those who are fasting for Greek lent a variety of different food is necessary. Do you know what Greeks used to have for breakfast some generations back? Bread and olives, which is part of the Mediterranean Diet and that kept them strong and healthy to work all day in the fields. Olives are very high in vitamin E and other powerful antioxidants and iron. Studies show that they are good for the heart and may protect against osteoporosis and cancer. There are many diﬀerent kinds of olives, with varying ﬂavours and colours. Greece produces the best varieties of olives in the world and I am sure you all know Kalamata olives. However, there are many more and if you visit Greece you will find them in all groceries, supermarkets or in any farmers’ market where you will find a bigger variety. Try them to ﬁnd your favourites. However, our eating habits have changed over the decades and rarely do people eat bread and olives for breakfast. However, if you wrap your olives with either phyllo or yeasted dough, this is something you will want for breakfast every day! Eliopita tylichti or strifti, is made by rolling a big piece of phyllo and filling it with olives, onions and aromatic herbs which is then made into a roulade. Alternatively, you can can make yeasted dough, spread the olive mixture, same way as with the one with phyllo and make it again into a roll. Eliopitakia is the diminutive of eliopita, so these are mini olive pies, which are usually served as finger food at parties. Elioti or eliopsomo, is a bread with olives. The most simple form of the bread is to make a yeasted dough, similar for pizza but instead of adding water, you add orange or mandarin juice. You then mix the filling ingredients in the dough and let it rise. You then bake it as you would bake any other bread. This is called Eliopsomo, which means “Olive Bread”. See also my other Olive Bread with Rosemary. You can also make small turnovers. These were made with yeasted dough but you can also make them with phyllo, same way as Kolokotes (pumpkin turnovers). Roll out the dough, cut it into discs, using a small plate as your guide, add the filling on one side, cover with the other half and press with a fork to enclose the filling. Bake until golden. The filling ingredients are the same for all three. You can use Kalamata olives, green olives but my favourite for eliopita are throubes olives. These olives mature on the tree until they wrinkle and look like raisins but much bigger, that’s why in Greece they call them “stafidiasmenes”, which means wrinkled like raisins. The best variety is that of Thassos island, which are naturally sweet. Other varieties of throubes from other regions, are cured in salt so that their bitterness is removed. I have twisted this basic recipe many times and one of my creations is this delicious Savoury Cake with Olives. Whether you make Eliotes, Eliopitakia, Eliopsomo or Olive Cake, I am sure you will love it, not only during Lent period but any time of the year. For the smaller ones, cut phyllo into 6 x 8 cm pieces. Add some filling on one side and make a roll. Press edges with a fork to seal in the filling. Brush with olive oil or whisk the egg and brush it on top. Cover them with sesame seeds. Line a baking tin with parchment paper or slightly grease it. Place them in the tin next to each other and bake in a preheated oven to 180o C / 350o F, for 35-45 minutes or until golden brown. When the dough is ready roll out into a thin phyllo and spread the filling all over and roll to form into a roulade. Brush with olive oil and sprinkle some sesame seeds on top. Prepare a yeast dough (same as for pizza dough, using orange juice). Knead all the ingredients in the dough and place in a greased baking pan. Cover with cling film and a napkin and set aside to rise. Brush with olive oil. This and many more pastry recipes are included in my cookbook Mint, Cinnamon & Blossom Water, Flavours of Cyprus, Kopiaste as well as in Volume 1 of my e-cookbook, sold on all Amazon stores. You can find more Lenten Recipes clicking on the link. Interesting touch with the oj Ivy. I love olives and these look really crispy. Considering how many “elies” you have available in Greece. Where do you begin? Yum – I’d like these for breakfast tomorrow please! Yummy Ivy, I so enjoy visiting your blog and discovering new and delicious dishes! Actually this kind of breakfast is right up my alley! Sounds wonderful! ooh I have never had these before Ivy but they look SO good. I just know I would love them. Just a quick note to say thank you everybody for visiting and commenting. I just have so little time lately and cannot spend a lot of time on the computer. These look delicious Ivy; I’ll bet the sesame seeds really add a lot of flavor. And very cute too! You had my heart when you said, “olive”. These pies are so cute looking. I’m scared of making my own phyllo. So greeeeat job! I wouldn’t have any problem switching my oatmeal for this breakfast, Ivy. I love these! I love being introduced to all these dishes. Have a good Easter Ivy. I love the traditional meals you post. Throws light on a new cuisine. These are wonderful! Ciao for now! I have been searching for these for a long time as the last time I had proper ones I was in my Yiayia’s vilage in Prothromos. Whenever my famliy bakes bread, we always use OJ, but also cinnamon water, it just gives it a nice subtle spice and colour to the dough.